1. Which Question Paper Type of Geography is given to you? 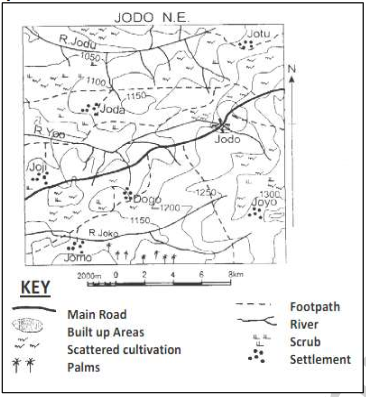 Use the map of Jodo N.E below to answer question 2 to 5. 2. The likely occupation of the people in the area is ___. 3. River Yoo flows towards the ___. 4. The bearing of Jodo from Joyo is ___. 5. If the map is enlarged twice, the new scale would be ___. 6. The annual range of temperature of Delhi is ___. 7. 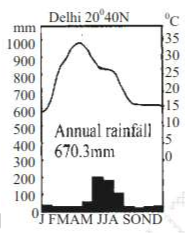 The climate can be described as ___. 8. The principle of a closed traverse is that ___. 9. The equatorial circumference of the earth is ___. 10. Which of the following rocks if suitable for the construction of roads and building purposes? 11. Mountains formed as a result of compressional forces are known as ___. Use the diagram below to answer question 12 and 13. 12. The features marked X is ___. 13. The feature marked Q is ___. 14. The Mediterranean Sea has higher salinity than the oceans because ___. 15. Sun-dial is used for recording the ___. 17. Pine, fir, larch and spruce are commonly found in ___. 18. The major components of soil are ___. throughout the year is known as ___. 20. An example of an atmospheric resource is ___. 21. Igneous rocks are differentiated from sedimentary rocks by their ___. 22. The massive removal of tree and forest cover without replacement is referred to as ___. 23. The total population of a country can be obtained from its ___. be a degree of ___. 26. Which of the following terms relates population size to land? 28. Rural settlements are important to urban centres because they provide ___. 29. Settlements that develop along communication routes are likely to be ___. 30. The greatest advantage of road transportation over other modes is that the former is ___. 31. The best breeds of dairy cattle can be found in ___. 32. The greatest benefit of mixed farming is that ___. 33. Which of the following is the busiest and most important world shipping route? 34. Which of the following groups of countries is a major producer of rubber? A. Malaysia, Liberia and Indonesia. B. Indonesia, Malaysia and Zimbabwe. C. Malaysia, Niger and Liberia. D. South Africa, Liberia and China. 35. The greatest industrial areas of the world are ___. 36. The Obudu Plateau is noted for its ___. 37. Livestock rearing in Nigeria is still predominantly the occupation of ___. 38. Which of the following has the highest concentration of industries in Nigeria? 39. The location of cement industry in Ewekoro, Nigeria is largely influenced by ___. Use the diagram below to answer question 40 and 41. 40. The soil type found in the area marked S is ___. 41. The area marked T is rich in ___. 42. Which of the following winds is responsible for the dry season in Nigeria? Use the map below to answer question 43 and 44. 43. 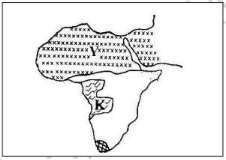 The area marked K represents what type of vegetation? 44. The area marked Y is known as ___. 45. Which of the following groups is known for nomadic grazing? 46. Which of the following countries has gold as its major foreign exchange earner? 47. Which of the following is the largest country in West Africa? Use the map below to answer question 48 and 49. 48. The area marked P is ___. 49. The area marked Q is best known for mining of ___. 50. 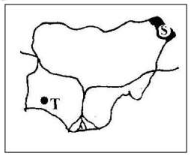 Which of the following rivers is an inland drainage?